It’s been a couple of weeks now since I last posted on the blog and a few people have noticed that I’ve been quiet on social media, that I just kind of disappeared. Don’t worry, I’m absolutely fine but I was unwell for a couple of weeks so took a total step back in order to give myself a chance to recover and reset. The last time I posted, I mentioned that my Sunday run had been a bit of a challenge, that I had been having a bit of an “off” day. As it turned out, that was the first sign that my body was fighting an infection and all its energy was going to that. As the day wore on, I felt worse and worse, leading me to take time off work ill and pay a visit to the doctor where I was given some antibiotics. The infection was stubborn, putting up quite a fight against the antibiotics and it took some time before I began to feel any better. It was only when I did, that I began to realise how unwell I had been feeling. It was like a fog lifted from my brain and I began to have a bit more energy rather than sleeping for about 12 hours a day (pretty impressive for someone who wasn’t exactly moving far whilst awake – my transition to becoming a cat is coming along nicely haha!). Steve noticed that I was generally less sluggish and more focused – I had clearly been under the weather both physically and mentally and at last I was coming out the other side to feel more like my usual self. My faithful companion was by my side the whole time! While I was ill, I didn’t really have the desire or focus to do much beyond sleep, watch tv and catch up on some reading. I FINALLY watched Stranger Things then Steve and I got totally hooked on This Is Us. I began each day with a nice hot bath and read a bit of whatever book I had on the go at the time – I went through 2 or 3 fairly fast-paced thrillers which didn’t require me to think much. I got hopelessly lost down a YouTube rabbit hole of Disney Parks videos thanks to a link my sister sent me. And I napped like a champion! On the flip side, I missed work, yoga classes, a trip to the theatre, a nail appointment and, of course, running while I was glued to my comfortable chair cosied in with a hot water bottle and feeling rotten. I didn’t post anything on social media, I didn’t summon the brain power for any blog posts, heck I only left the house to go to the doctor and to get some food shopping with Steve! I felt like the world was still turning but I had stepped off for a moment…and actually that was just what I needed. Now, with the illness behind me, I feel so much better. It’s the school holidays but I’ve been in to tidy up my classroom, catch up on what my classes were doing in my absence (you can never be sure how much of the work you send in will be done when you’re not there!) and go through my emails. I’ve sorted out a few bits and pieces around the house, I’ve started some daily yoga at home and, more importantly, started to run again. I feel like myself again and have learned a valuable lesson about looking after myself more. It was a busy term and I know I prioritised my pupils’ needs over my own at some crucial points, leaving me run down and open to illness. Not a mistake I plan to repeat! So hopefully normal service can resume, with my regular posts and regular training routine. More importantly, I can now enjoy my spring break, something I wasn’t so sure was going to happen not so long ago. I might even leave the house a bit more…! Have you seen “Stranger Things” and/or “This Is Us”? Week In Review – Groundhog Day! The aim is to keep most of the week really consistent, with the real changes coming around the Thursday drills and Sunday long run. This week began, as ever, with my Hatha yoga class which I really love. It’s a nice, slow class which is perfect after my Sunday long run and busy Monday at work, but there are also plenty of options which allow me to build strength and flexibility week on week. I always really appreciate this one on a Monday evening, especially since on this particular Monday I had gone from a work meeting, to an appointment, to the vet to collect some routine flea/worm treatments for the kittens, then to yoga, without actually going home! That time to unwind was just what I needed so I felt much more relaxed when I did get home after class. Tuesday was an early start for my 4 mile run. Although I wear my watch to log the miles, I run this one by feel, aiming to keep it fairly easy and comfortable to get my legs moving again. Basically it’s a recovery run. Yet again it was really windy outside (apparently Tuesdays are windy right now. Surely it should be the day after – Windsday? *groan*). That evening I rounded off my day with some at-home yoga before settling down to relax (Tuesday is usually my best chance to find a bit of space in the evening) and this was time that I really appreciated since Monday had been so packed. No workout on Wednesday – it’s currently my rest day so I can fit in my orchestra rehearsal without having to rush and getting stressed out. Another early start on Thursday, this time for my drills. Basically the same as last week – 500m focusing on good form – but adding a further 2 reps this week. I took a slightly different route so that I could include the little bit of extra distance and felt pretty good doing these. These reps are more about form than pace, but that focus should mean that I run better in my other runs – especially parkrun. I quite like setting my watch up with the workout and just following the bleeps until it says I’m done. Rather satisfying! That evening I had my Ashtanga class and felt really strong through 2 rounds of Wheel. I was conscious I was using my arms more to move into the posture rather than relying on leg strength so that’s a progression. The flip side to that is that my headstand was a bit off this time. I held it for 2 or 3 breaths before having to come out of it and although I reset to try again, my body was having none of it so I accepted that it just wasn’t my week and rested in child’s pose until we were ready to move on. I know there will be times when postures like that just don’t work and that’s ok.
Steve was able to fit in a session on Friday afternoon so I headed to the studio after work. Lately he’s been giving me circuit-style workouts and mixing up the exercises. This week’s set was designed to build intensity and power. It was a bit like Metafit in a way, but much more running-specific. I was assured that I would run well on Saturday as a result, but was doubtful as I felt the weariness in my hip flexors! On Saturday morning Steve was away quite early for a couple of clients so we arranged to meet at parkrun. I knew I didn’t have time to run both there AND back as I had an appointment, so decided to run down, taking a less direct route to add distance, then get a lift back home with Steve afterwards, making it an “open sandwich” (no top layer!). It was quite chilly but I was determined to debut the new leggings I bought with my Christmas voucher from my sister! My run there ended up pretty perfect. A 5k “warm up” with just enough time to pop into the sports centre to grab a mouthful of water from the water fountain before heading to the start line in time for the briefing. I had thought I felt a little sluggish as I ran down so wasn’t sure what kind of a run it would be, but as is usually the case my legs felt ready to run as soon as the Run Director said, “go!” Immediately I found myself a bit boxed in and stuck behind others who weren’t moving quite as quickly as I wanted to and it struck me that with our numbers continuing to grow I might have to start positioning myself a little further forward in order to avoid this. It meant that my first mile was a around 25-30 seconds slower than I would have liked, but when I did find some space I was in good shape to push on and found myself passing a number of people. Checking my splints later it was a pretty solid Royal Flush Negative Split! The same time at the same parkrun two weeks in a row earns the Groundhog Day badge on the parkrun Chrome extension (if you haven’t used it yet, you really should – great fun! )…but I already have the Groundhog Day badge! Yes, I have now run my arbitrary SECOND Groundhog Day, or Groundhog Groundhog if you will. Rather conveniently, the Chrome extension does show that I’ve achieved it twice, which is cool. Sunday’s long run added a mile to last week’s and had pretty much the same format with every 3rd mile faster – but this week I remembered to put the auto pause on so I got a better idea of what I was actually running rather than including all the time I spent waiting to cross busy roads! It was a chilly but bright morning and I enjoyed the run. At this point it all feels really manageable and I’m finishing my runs knowing I could have gone on. That’s always such a good feeling as it means fitness and endurance are progressing well and my body can handle more as the weeks go on. I do like my Sunday runs, listening to podcasts and taking in the scenery and am perfectly content that way for hours. Perhaps that’s why so many of my (non-running) colleagues just can’t understand me! Do you use the parkrun Chrome extension? Are you a solo runner or do you prefer to run with others? And that’s a wrap! 2018 has come to an end and with it The Year of Me!!! For the most part it’s been an amazing year with lots of fun and adventures. I also think I did a pretty good job with my goals and have added lots of value to my life. Here’s one final check-in with how things went. If you’ve been following along then you know I completed this one at the end of September and have since been maintaining my consistency to see how many miles I could run. 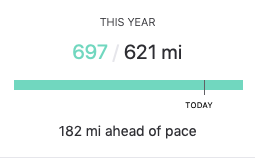 In November I passed my highest yearly mileage ever, to guarantee a number in the 800s for the first time ever. And that final total? 837 miles. I’m feeling pretty pleased with that. I love my yoga, but had somehow found that in the latter part of the year I was managing 4 sessions easily and not always converting that to a 5th. Throughout December I made a conscious effort to make sure there were 5 yoga sessions each week, reminding myself that just 5 minutes was all it took, so returned often to one of my favourite bedtime sequences. It was great to take that time and really helped me wind down before bed. Another one which was completed in September, but the reading didn’t stop there. My involvement in some online/social media reading groups this year has really helped me to find more time to read and as a result I ended up with 44 books read this year, an average of over 3 books per month (and with the last one finished on Hogmanay!). 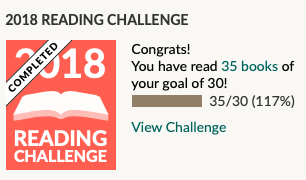 I’m thrilled with that and will be settting myself a bigger target for my Goodreads challenge in 2019. One of my favourite goals since I love my bed! The biggest difficulty here was that I tend to be a natural night owl, but the decision to switch my runs from the evening to the morning after the October break made a big difference to that and I found myself coping much better with mornings. Don’t get me worng, I’d still rather stay in my bed longer, but the morning runs have created more time in the evenings which means I can get to bed early without feeling like I’ve barely had a moment to myself. I’ll definitely be continuing with this one! This one was put well and truly back on track with my decision to make this the focus of a 100 day challenge I began in September:100 TED talks in 100 days. I didn’t quite manage one per day, but I did watch 100 in 100 days and it was brilliant! Hopefully that has started a habit of delving into my watchlist more regularly as there is so much great content in there and I feel like I learned a lot of interesting things. Another of my favourites as I have become such a podcast addict. These days I’m probably listening to 1 or 2 per day (more if I’m out for a long run or doing household chores) and I just love it. Podcasts have been in my life for a while now and are definitely here to stay! Weirdly, I found this one quite hard throughout the year, which I wasn’t expecting. I thought it would be good to respond to the prompts but choosing them often took longer than I expected so they were often towards the end of the month. Somehow I didn’t quite get to it in December but I think that was because I didn’t find a prompt I was desperate to respond to. It was an interesting goal when it came to posting a little more often, but I think I found it more of a bind than an inspiration. This one has fluctuated throughout the year but overall I think I have cut down on the amount of mindless scrolling I do (which probably helped to create all that reading time!). December is maybe a little different as I like sharing festive activities but I try now to share my post then put my phone away again so as not to get caught up in other things. The weekly report I now get from my phone is pretty interesting and I’ll be continuing to keep an eye on that to make sure I don’t slip back into bad habits as more and more I find it important to be present rather than distracted by trivialities on a screen. Overall, I have to be pleased with my progress. It would have been unrealistic to expect to be “perfect” in everything I chose, but I also chose goals that made me focus on a process rather than an outcome. Yes, I had tangible goals in my running mileage and reading, but to get there I had to enjoy several months of running and I got to sit down and get lost in lots of good books. Neither of these could ever be negative experiences for me. Now it’s all about maintaining some of the positive habits I created, but without the pressure of checking up on myself each month. We’ll see how that goes. In the meantime, I wish you all the very best for the year ahead. How did you get on with your goals in 2018? Monday was a pretty long day and mentally exhausting. I’m trying hard to remind myself not to trust a Monday as right now they don’t really make me feel good, but that all changes when I get to my yoga class and this was the first one in a new 5 week block. It was so nice to have the time for myself to tune into my breath, listen to my body and stretch away the worst of the day. On Tuesday I faced the first test of my new early morning running regime – it was cold! I was ok with the dark (let’s face it, it would be dark for evening runs at this point in the year too) but last week was fairly mild in the morning so when I had to rouse myself from my cosy bed into a distinctly chillier room, it was a bit of a challenge! Thankfully I did get on with it and completed a nice 4 mile loop. I’m keeping the pace fairly easy on my Tuesday run so it was quite pleasant, even when it started pouring with rain half way round! This, of course, meant another rest day on Wednesday so that I could get to my orchestra rehearsal without having to rush or feel pressured. I did have “a bit of a day” so did a short home yoga practice before I went, but otherwise enjoyed the break and bit of headspace before my rehearsal. I was slightly later home than I wanted, but still got myself out of bed on Thursday morning for my run. After my soaking on Tuesday morning I checked the forecast carefully and noted that there was a 90% chance of rain at the time I would be running. This meant I dug out a jacket to wear and, predictably, there was no rain at all. Typical! Still, I enjoyed my run, this time choosing an out-and-back to cover 4 miles which I’m finding to be an ideal distance for a pre-work run. That evening saw me at Ashtanga yoga, however my usual teacher wasn’t there and we had another teacher covering for her. She’s taught us before and I like her, but I always find it interesting how different the class can feel with another teacher, particularly given that we are following a specific sequence of postures. I enjoyed the class and did pick up a couple of tips for ways to move into one or two of the postures, but missed the opportunity to work on my headstand. I’m trying to fit in a training session with Steve every Friday, so headed to the studio after work. We have been using the TRX to work on upper body/core and I like this as the TRX offers all sorts of ways to work with my own bodyweight and it’s easy to progress within the exercises we do. This week’s gem was a kind of one-armed press up, which I was at first doubtful of but did actually manage. Go me! I definitely felt like I had earned my Friday night food this week. The forecast for Saturday morning was for more rain, but after a week when I had to practically chisel the ice from my windscreen a couple of times it was nice to return to some milder weather. I opted for capris for parkrun, but could probably have got away with my shorts. It was Steve’s first stint as Run Director so he was away pretty sharp and I drove down a little later. The weather at this point wasn’t too bad, but I did wear an extra layer to keep me dry if the rain started. To be honest, I avoided the worst of the rain while I was running but there was quite a strong wind which made some parts of the course feel quite testing. I definitely felt like I was working harder than the 8ish minute mile I was clocking, so was pleased to finish feeling strong with a 24:43, especially as it’s been a couple of weeks since I did any faster running. As always, we were meeting Steve’s brother for a coffee but Steve needed to finish his RD duties so I arranged just to meet him there as that gave me a chance to head home and shower/change. By the time I got my bacon croissant I was STARVING and guzzled it down pretty quickly before enjoying a nice pot of tea. We then got our weekend errands done and spent the afternoon chilling out at home. I, as is becoming customary, had at least 1 kitten pinned to my side at all times 😂. Incredibly, they’re 6 months old now and my boy, in particular, is becoming quite the lap cat. No objections to that from me! Room for two kittens. Just! I knew I would be quite busy on Sunday so made sure to get out for my run reasonably sharp. The sun was out again and after being all bundled up last week, it was mild enough for me to get my shorts back out. I do like when I can do that. I had decided on my route in advance as I wanted to cover 10 miles, but hadn’t realised that the 5k and 10k Mo Runs were taking place and that I would end up in the same place as part of their route was on the path around the North Inch. In the end I ran there anyway, just in the opposite direction and making sure to stay out of the way of those racing. The path is wide enough and there were still lots of people walking and cycling anyway so I didn’t think I would get in the way. It was actually quite interesting to watch the runners and passed the time nicely. Before I knew it I had run my lap and was on my way home. After my run I got showered, changed and ate my lunch then it was time to get ready for an orchestra rehearsal. Our concert is next Saturday, but I’ll miss the rehearsal during the week because of a parents’ night so I wanted to make sure I was at this one. It was good but I was definitely in need of a chance to relax when I got home. After all that, I really enjoyed relaxing in my Sunday night bath to round off the week. Now to do it all over again…! How easy do you find it to adjust to the winter darkness? Ever accidentally ended up running in the same place as another event? I actually can’t believe it’s the end of October. It barely seems 5 minutes ago that I was preparing for the Stirling marathon, and even less time since I was sweltering in the summer heatwave, yet somehow we’re now down to the last couple of months of the year. Time to check in once more and see how I’m doing with my goals for The Year of Me. I achieved this one at the end of September and am now simply curious to see my end of year mileage total. 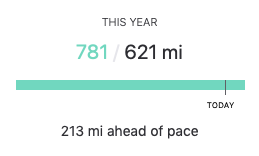 2017 was my highest to date at 752 miles. Will it be higher or lower? I did submit my completion of the 1000km to the virtual “race” I had committed to and received my medal last week. It’s pretty cool! This one had been falling a little short, but I think I’ve got it back on track. It was pretty easy to fit on lots of yoga at the start of the month when it was the school holidays but not always so easy during term time, so I have been turning fairly often to a short bedtime sequence that I enjoy. As I settle into the new term I’ll hopefully find more time for some longer sequences, especially now I’ve changed some of my training routines. Again, I achieved this one in September and am on course for a “record breaking” reading year. I’m currently at 35 books read with plenty of year still left. I didn’t worry so much about this one during the school holidays as I don’t have to get up so early, but was still in bed just after 10. Now that I’m back in the work routine I have been trying hard to get plenty of rest, particularly ahead of my early runs, and I do think I’m getting a decent amount of rest right now. I’m still taking part in my 100 day challenge to watch a Ted talk per day and although there have been a couple of days when I missed out due to other commitments, I have always made sure to catch up so whatever happens I will watch 100 talks in 100 days and more than fulfill this challenge. It’s so interesting to see what’s out there and I’m really enjoying working my way through my watchlist. Still doing well with this one. It boils down to a podcast per day (I usually listen to one on my journey home from work) and an extra at some point. On some days I can manage two per day and in the holidays I spent a couple of days reorganising all my cupboards and drawers so probably listened to about 8 per day! I was, for once, super prepared this time and responded to the prompt Costume. I think I have this one back on track most of the time. I’m actually really enjoying the new “Screen Time” feature in iOS12 as. I get a weekly report on how often I’m looking at my phone as well as a breakdown of where that time is going e.g. if I’m reading news articles/blog posts or simply wasting time in the infinite scroll rabbit hole of social media. Definitely a useful feature to have and I think it will help me to think a bit more carefully about what I’m doing with my phone. Have you achieved any of your goals for the year? Are any of your goals turning out to be more challenging than you expected?